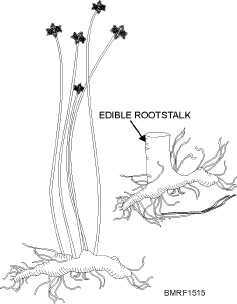 The tropics have no greater proportion of poisonous plants than the United States. If youre in doubt about whether plants are poisonous or nonpoisonous, observe the habits of vegetable-eating animals, such as birds, rodents, monkeys, baboons, and bears. Usually the foods these animals eat are safe for humans. Cook all plant foods because cooking removes plant poisons (except those in poisonous mushrooms). NOTE Avoid eating plants that taste bitter. Also avoid eating untested plants that have milky juices. Dont let the milky juice contact your skin. You may eat most animals. However, some, like mollusks, may introduce parasites into your body, especially if you eat them uncooked or when they arent fresh. Crustaceans are almost always edible, but they spoil rapidly and may harbor harmful parasites. Be sure to cook the freshwater variety; eat the saltwater variety raw if you desire. You have no simple way of telling whether a fish is edible. That depends on the place in which they live, their source of food, or even the season of the year. Often fish that are edible in one area of the world are not in another. At first, eat only small portions of any fish. If you feel no ill effects, you can probably continue to eat the fish safely. 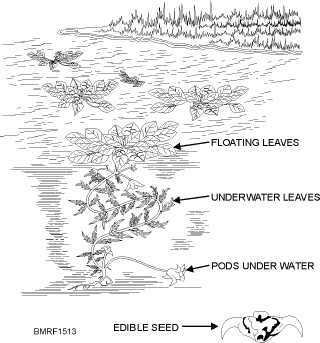 15-21 Student Notes: Figure 15-13.Water chestnut. 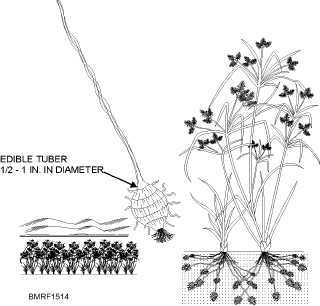 Figure 15-14.Nut grass. Figure 15-15.Bullrush.